Adaption of Alexandre Dumas' novel The Count of Monte Cristo. Set in the time just before Napoleon's return to power, this adventurous tale follows the trials and tribulations of Edmond Dantès. After being unjustly imprisoned on the day of his wedding, Edmond devises a plan that leads to his escape, a hoard of treasure, and a new identity: the Count of Monte Cristo. A tale of courage, vengeance, romance, and betrayal! 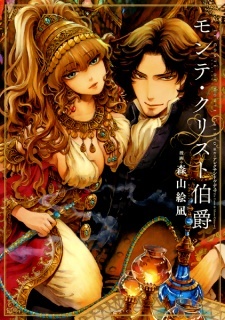 Monte Cristo Hakushaku was published in English as The Count of Monte Cristo by Seven Seas Entertainment on December 19, 2017. Having read the original book that inspired this manga, I'm gonna try to make a short and useful review of it, while comparing it as well. The story followed well the one from the original book, although certain parts were left out. That can confuse the reader, since nearly every information in Monte Cristo is valuable and not to be missed. I wouldn't advise to start with the manga if you're not already familiar with the characters and the plot. I found it especially fascinating to see the characters 'come to life' in manga form. I always had a bit of trouble imagining them in my mind, and given the amazing art style, it was definitely very pleasing to the eye. You won't be disappointed for that. The way the original author made the characters, and their complex personalities, makes this manga all the more interesting to read. You get to see every side of them, going from extreme confidence to despair, and from happy to broken. Edmond is honestly one of the most realistic and complicated character I've ever known, which mainly brought me to read this. I've had a whole lot of fun reading it, but once again, I really recommend reading the original book if you want to entirely understand the whole story without anything left behind. Despite the missing parts of the plot, the whole adaptation is truly fantastic and something not to miss on. I highly recommend it.